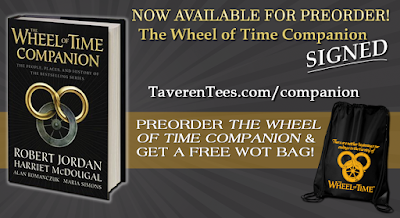 Ta’veren Tees: The Wheel of Time Store, is extremely proud and excited to announce that we have a limited amount of SIGNED copies of The Wheel of Time Companion: The People, Places and History of the Bestselling Series by Robert Jordan, Harriet McDougal, Alan Romanczuk, and Maria Simons. If you can’t get to a book signing, this a great way to get a signed book! The Companion is available for preorder now at TaverenTees.com/companion. Preorders through Ta’veren Tees will receive a free WoT nylon drawstring bag with their order. All items ordered with the Companion will be held and shipped when the book is released on November 3. Over the course of fifteen books and millions of words, the world that Robert Jordan created in The Wheel of Time series grew in depth and complexity. However, only a fraction of what Jordan imagined ended up on the page, the rest going into his personal files. Now The Wheel of Time Companion sheds light on some of the most intriguing aspects of the world, including biographies and motivations of many characters that never made it into the books, but helped bring Jordan's world to life. The book also includes art by officially licensed The Wheel of Time artists.